"RSS Strategy Chart and Link Zipper Strategy"
Every time you create a site that generates an RSS pheed you want to "mash it", which means to add it to a bunch of other RSS pheeds. You can use Blogbomb or Yahoo Pipes to mash pheeds. 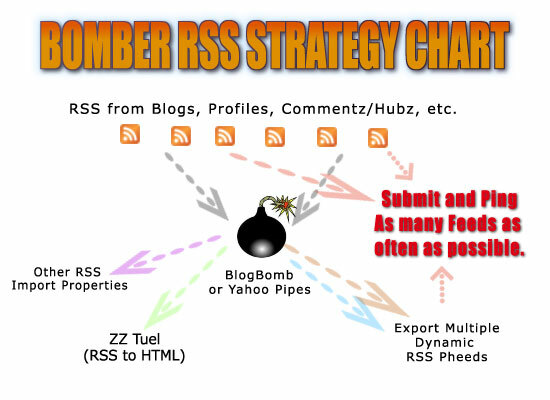 With BlogBomb, the more RSS pheeds you put into it, the more you can get out of it. In theory, you can create an infinite number of dynamic pheeds that you can not only submit, but will "update" every time they are pinged. Again, "in theory". In reality, you'll probably get your site and/or IP banned at some point in time. Each site will have different thresholds. But they aren't Google and you can be (and should be) a little more aggressive with them. Pinging and submitting RSS pheeds are two different things. Some sites you just need to submit your RSS and they will check every-so-often for updates. These are RSS directories and are just like web directories, but for RSS. You just need to submit each RSS pheed once. Ping services want you to contact them (called a "ping") each time your site updates its RSS pheed. You should ping each time a page is added or updated and this is usually done automatically. WP blogs will have it built in, and some Tuelz have a pinger built in, and Pingz is still fairly functional for sites with RSS and no auto pinger. A few sites are both: You need to submit your pheed and also ping each time it updates. Technorati is one that needs both. Don't worry too much about this, just learn to ping and submit. You can use RSS in a number of ways. First, let's talk about link building. RSS pinging and submitting is a very effective way to get links, one of the best. But it isn't as easy as setting up a single RSS pheed or even a good RSS "blackhole". This is Google's blog search pings...These are the blogs telling the Google blog search "hey look at me! I just updated!". This doesn't mean they will rank, only that they have asked Google to check out their updates. Google will make a list of these URLs then send the spiders out to index the updates. Not only is this a great way to get Google spiders to your site, it's also a great spy tool. Now refresh the browser page a few times very quickly and note the changes. There's a third reason for pinging and submitting RSS pheeds, and that's all the scrapers that grab RSS pheeds and use them on their own sites and blogs. This what we are trying to do...We are trying to get as many RSS pheeds on as many places as possible in the hopes they will be scraped by others. But if you did a refresh of the Google blog ping you'll see how fast this can update. And scrapers tend to grab pheeds that are the newest. If you can get your pheeds scraped, you can get good links on a variety of sites and blogs pointing back to your properties. You want to "optimize" your RSS pheeds with this in mind. Think like an SEOer doing some RSS scraping. Use the keywords you think they are using. If you can find your RSS items on other blogs and sites, try to figure out where they got them from. If you can, you have a "backdoor" onto their sites, in essence you are spamming the spammers. But to do this, you need a bunch of RSS pheeds from all over the place (different IPs, etc). And you need to keep creating more, submitting them, updating them and then pinging them. Over and over. 1. "RE: RSS Strategy Chart and Link Zipper Strategy"
As you keep adding all your RSS pheeds to your "mash", you can add them to ZZ Tuel pages. Let's say you have a PLR article or two. Use ZZ Tuel to add your BlogBomb "mash up" of all your RSS pheeds to these articles. For example, get a free host and use ZZ to add new random RSS items to your articles and have it update every so often. This puts random links to your properties on these article pages. Remember the "Bing Loophole"? It's basically adding random links so each time Bing comes by it indexes new links. Bing was adding the new links it found, but didn't subtract the missing links. I can't promise this still works, but ZZ Tuel can do this and it's surely worth setting up and testing on a free host. And it's not a bad way to get profile links indexed. Just create a simple 8 page site and add a few links to each page using ZZ Tuel and your mashed RSS pheed. Commentz/Hubz are also good for this...When you set up a project, use Commentz/Hubz to post new articles. Commentz/Hubz will add them to an RSS pheed. Submit and ping this pheed, as well as add it to your mash. In the mash it can be submitted again, then added to your network of properties for even more exposure of the links in your RSS pheeds. With Hubz, you can "auto drip" articles and it will update an RSS pheed when it updates, creating more ping and linking opportunities. You can even combine ZZ and Commentz/Hubz projects, using the benefits of each in tandem. 2. "RE: RSS Strategy Chart and Link Zipper Strategy"
Above is a very SAFE linking strategy that's built for the long term. The thing to note is that the "zipper effect" is how the typical web 2.0 link wheel is broken up with independent IPs. Check out the gray arrows for this and see how they zigzag from hosting IP to web 2.0 site back to host back to 2.0 site. By adding these unique IPs to the "zipper", you're breaking up easily detected link wheel IP footprints. The red arrows are another zipper, but they "skip" a few notches in the zipper. The point is to link two to properties, while avoiding a "link exchange". Also, this is a GENERAL THEORY. Don't get caught up in perfection. It's OK to sometimes link a 2.0 site to another and to link a host to another. Just break up the patterns of a typical link wheel and don't chain together a lot of consecutive 2.0 sites. 3. "RE: RSS Strategy Chart and Link Zipper Strategy"
Quick Tip: It's OK to use spun/rewritten content. Just make sure the content is pretty good and that you use the zipper linking method for content as well as IPs, and don't link similar content directly. 4. "RE: RSS Strategy Chart and Link Zipper Strategy"
Here's a very good basic linking guide (hosted on Imageshack)) that gives a very good strategy. Note how it rotates the linking order of Blogspot, Hubpages and Squidoo, then uses the same resources to link to these 3, but also in different orders. Try this strategy. Then the next mini-linking net you build, make a slight substitution or change, using a different resource or two. 5. "RE: RSS Strategy Chart and Link Zipper Strategy"
Lovin that Niche Dog Logo and stuff Kurt. Seems you have been hiding your graphics skills under a bushell. These process maps are really great can we have more of them. I am one of these people who loves a step by step process and it works great for giving to outsourcers as well. 6. "RE: RSS Strategy Chart and Link Zipper Strategy"
>been hiding your graphics skills under a bushell. That's not my chart. It's posted on an image sharing site, so I included it here. I've removed it to ensure there's no confusion. Having said this, with the recent Google "farmer" update, I wonder how long these linking strategies will hold up.